We have cause for celebration in England and Wales. Now that the Kaiser is beaten in the fields of France we can enjoy a pint of beer after 11.00 o'clock in the evening. Admittedly, it has taken a while for us to get around to doing this, but hey, Parliament tends to move slowly. Anyway, I availed myself of the new drinking laws for the first time last night, enjoying my habitual pint of Guinness in my local at way past midnight. My local is a slightly tortured place; I live South East London, an area described as "up and coming", which translates as "still a bit rough". My local, which refurbished about a year ago, transformed from dodgy old man boozer into gastropub. What tends to happen in transitions like this is they rip the soul out a place and it becomes another vaguely trendy bar with ironic wall paper. Whilst guilty in some departments of this trend my local still feels like a proper pub. The restaurant section out the back is just plain awful, overpriced, badly thought out, incompetently cooked modern British. The main saloon bar bit out the front is still pretty good, they cellar their beer properly and they don't have any TV's so you can drink your beer and read your paper in peace on a big leather sofa (no self respecting refurbished pub can be without big brown leather sofas these days, usually the sort you parents had in the '70's, it's ironic, you see). Now, I'm not one of these people that has a problem with pubs refurbishing and offering more that some stale nuts in the way of food. I like the fact that we are in some ways reclaiming our pubs in London, I like the fact that there are pubs that serve good food again, that have proper kitchens, not just frozen slurry heated in the microwave. It's all for the good in my book. It's just a touch disappointing when it is done cynically and I still have a place in my heart for shabby boozers with old blokes in flat caps and a picture of Winston Churchill on the wall. Franklins, 157 Lordship Lane, SE22 8HX. Probably more famous for its restaurant than it's bar. The food is generally very good and a great wine list coupled with a few nice ales. The archetypal gastropub it has to be said, but then with a list of savouries on the dessert menu and some fine game cookery going on I'm not complaining. No sofas oddly. The Lord Palmerston, 33, Dartmouth Park Hill, London, NW5 1HU. Ok, so another foodie pub and the clientele have got a bit self satisfied as of late, but there's an old timer that brings his dog in for a beer which I've always liked. I've celebrated some cracking birthdays in the upstairs room here. A couple of brown '70's sofas. The Market Porter, 9 Stoney St, London, SE1 9AA. Bang opposite Borough Market and like many market pubs opens at 6.00 am. Famous for well kept beer and crowds. Always a bit of a treat if you've been shlepping round the market and need refreshment. Don't seem to recall any leather sofas. The Hand in Hand, 7 Crooked Billet, Wimbledon Common, London, SW19 4RQ. For pretty much anyone born in the late 60's or early 70's and reaching your teens in the mid to late '80s and living in South London then you'll remember boozy Friday nights outside this pub on the common. Much underage drinking and smoking dodgy pot. Ahhh, halcyon days. No idea what it is like these days. No sofa's as we used to sit on the grass. The Royal Oak, 44, Tabard St, London, SE1 4JU. An unspoiled Victorian pub. Original fittings intact and a joy to behold, but a proper working pub not a touristy anachronism. Lovely beer; Harvey's and the like. 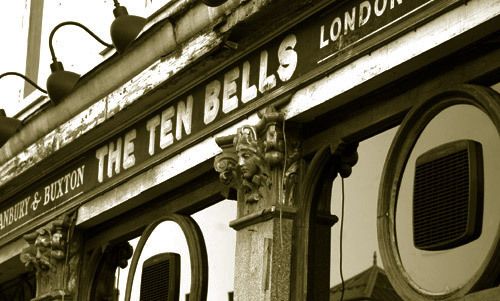 Ten Bells, 84 Commercial Street, London, E1 6LY. A terrible pub these days. Plain awful. The pub is very very old and the last place anyone saw Mary Kelly alive before Jack The Ripper murdered her. Was called The Jack The Ripper for a while and they served "Ripper Tipples" until protests by feminist groups had the brewery change the name. They have tried to revert back to the original Victorian interior but failed dismally. A pity. Many many sofas. I am saddened. I loved the challenge of finding a place to drink after 11 in London. Oh well. Ooh, I must be "ironic." Cranky and I have a brand-new brown leather sofa. Thanks for this yumeee blog from believe it or not one of my favourite places in London! What's your edition on pie mash?